Did you know that your mid foot has 3 arches? Most of us only know about the medial arch on the instep. By the age of 75 we walk on average 100,000 miles/160,000 Kilometres or 4 times around the equator. Doing this on hard surfaces causes problems, one of which is the atrophy of the plantar fat pads. 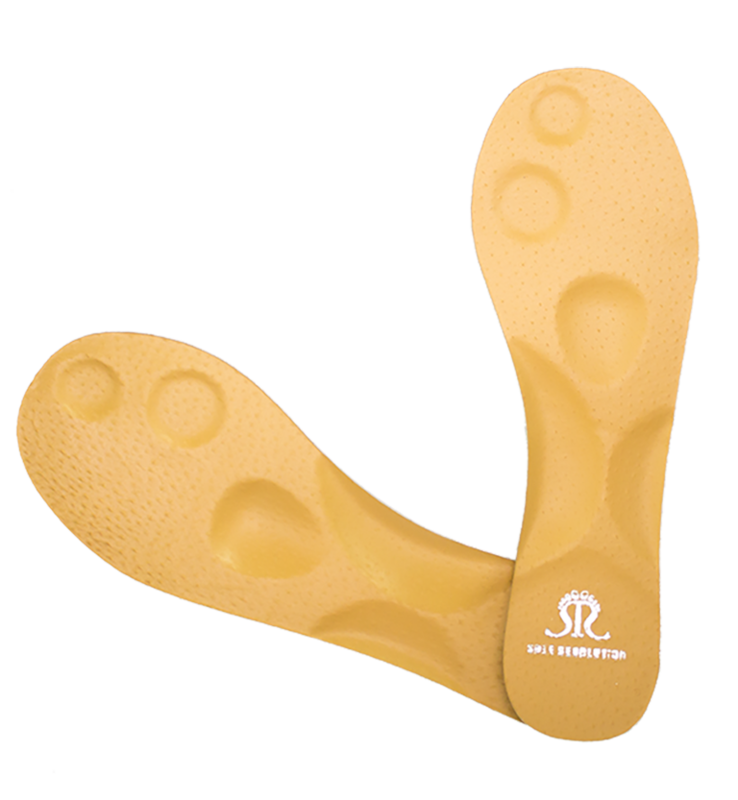 Sole Revolution orthotic insoles are designed to provide the support where it is needed, and help the body perform as it was designed. Sole Revolution orthotics are non-invasive and they are not designed to push or lift the arches up. They are designed to enhance the stability of the feet by not allowing the arches to collapse, whilst enhancing the spring like action of the arches through the trampoline like action of the supports whilst in motion. The purpose of the arches is to provide stability when standing, and the ability to absorb stress when walking, running, and jumping – similar to a shock absorber. If the arches have lost their integrity, this will result in a lack of stability when standing click here to watch the stability test. If the arches drop whilst we are active this can result in straining of the plantar fascia (the ligaments under the feet) as well as problems throughout the leg and low back. To help the foot overcome the stresses involved with standing, walking and running on hard surfaces such as concrete, wooden floors and tiles we have included support for the heel (calcaneus) as well as the first metatarsal head and base. By wearing Sole Revolution orthotic insoles you can help correct foot problems such as plantar fasciitis, heel spurs, Morten’s neuroma and bunions. The most exciting thing about using Sole Revolution orthotics is the way it helps the foot to work better by providing support exactly where your natural design needs it most. By supporting your feet you also support your ankles, knees, hips and low back – which provides your whole body with greater stability and strength. Why Use Sole Revolution Orthotic Insoles? Sole Revolution orthotic insoles are the product of years of research and clinical testing to provide you with the best possible level of functional support.